The sport of hockey arguably translates better to video games than any other form of athletic competition. The high-speed, hard-hitting nature of the game means that, if done right, a hockey title can provide hours of intense action. Throughout the years, there have been many excellent example of how to do a hockey video game right: Blades of Steel, EA Sports’ 16-bit NHL/NHLPA games, and even NHL 2k9 for the Nintendo Wii come immediately to mind as examples. 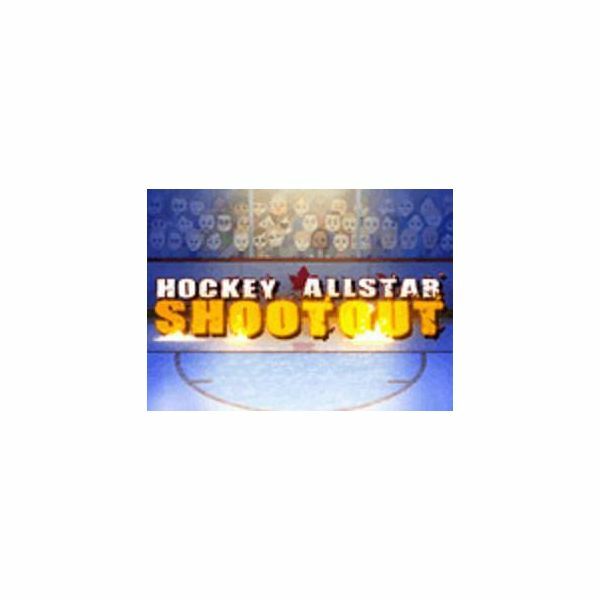 The WiiWare title Hockey Allstar Shootout, on the other hand, is an excellent example of how NOT to make a console hockey game. First, a look at the gameplay, but before that, a caveat. I knew going in that this was a 500 point WiiWare game and wouldn’t have a lot of depth or features, nothing even remotely like what EA Sports or 2k Sports have become known for. That said, even I came away disappointed with just how bare bones this game is. There are three modes here, but all are pretty much the same. In Head 2 Head mode, the point is to try and beat a goalie and score. You’re given five shots and your score is based on how many times you find the back of the net. In Sharp Shooter, targets appear in the net and it’s your mission to hit them, racking up as many points as possible before you miss with three shots. The final mode, Powershot, the goal is simply to take five slapshots and make the puck travel as fast as possible, wrecking some obstacles in the process. Each mode supports either one or two players and boasts three difficulty levels, but even so, it all feels remarkably similar. This sadly, is the biggest flaw in Hockey Allstar Shootout, and it winds up being an absolute game-breaker. The developers wanted a game that accurately captured the feel of firing off slapshots. The game uses both the Wiimote and the Nunchuck. You use the Nunchuck’s control stick to aim an on-screen cursor, which is supposed to direct your shot, and with the Wiimote, you hold down the B-button and mimic the movement of using an actual hockey stick. Sounds great in theory, but the problem is, it doesn’t work. At all. The checklist of problems is quite lengthy. The cursor has a bad habit of floating all over the place, making it way too hard to pinpoint a target. There’s a slight delay between when you complete your shot motion and the appearance of the on-screen puck — and if the simple existence of said lag wasn’t enough, it gets worse, because if you happen to move the cursor at all during that delay, the puck will wind up traveling to its current destination, not to where it was when you fired off the shot. Furthermore, the aiming is terrible. Sometimes it actually works, but often you’ll need to aim over the top of the net in order to try and go top shelf, and if you try to hit a high target, the shot will probably wind up going low instead. Last but certainly not least among the problems is the fact that in Head 2 Head mode, the A.I. goaltender has a seemingly superhuman ability to stop pretty much anything you throw at him except for blisteringly quick slapshots, which will leave you fatigued and your arm aching in no time at all. In short, the controls are rubbish. This is a bare bones production all the way. Again, considering the game’s price, this wasn’t totally unexpected, and would’ve been forgivable had the game been enjoyable to play. The graphics consist of a hockey rink setting, the net, a crowd filled with Miis, and on occasion, an absolutely grotesque looking goalie. The music consists of a lone hard rock track which plays during the title and menu screens and, to the developers’ credit, sounds like something you would hear at an NHL game. The crowd cheers and boos based on your performance, which is a nice touch, and the sound effects aren’t awful either. There just isn’t a whole lot of variety or content here, though, which definitely winds up hurting the overall score in this category. I see little or no redeeming value in Hockey Allstar Shootout, which is a downright shame since the core concept seemed at least somewhat promising. What NHL fan wouldn’t love a decent game where you could fire off slapshots with the best of them? Even if it wasn’t immensely deep, if the title could’ve mastered the controls, included some variety with objectives (say, shooting objects off the top of a structure in classic William Tell fashion or taking passes and firing off one-timers), it could have been at least a mild hit, in my opinion. Sadly, though, we’ll never know, because the folks at Big Blue Bubble haven’t mastered the controls. In fact, quite the opposite is true, as the controls are so bad they completely ruin the rest of the game. I know it’s just $5.00 (500 points), and you might be tempted to take a chance, but please, DON’T! For that same price you can download the WiiWare game Space Invaders Get Even, an NES classic like Super Mario Bros. 3 or the original Legend of Zelda, or any one of countless other video games that are immeasurably better, deeper and more enjoyable than Hockey Allstar Shootout.